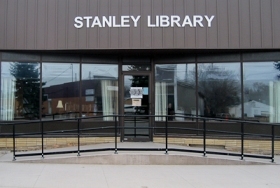 Stanley Public Library’s summer reading program, “Libraries Rock,” was held Tuesday, June 26 at the library. Participants read stories, finished a mosaic poster of a horn and musical notes, played Pass the Parcel, created rain sticks, made a group sound book and played musical notes on a life-sized piano. All participants were awarded prizes on the final day of the program. Henzlie Longmuir was the winner of a free book, Kolton Longmuir won a recorder and Avery Elllis was the winner of a Barnes & Noble gift card.